With a new Pixar Cars movie, Car 3, coming out in June 2017, we would like to go back and look at how the main characters have changed over the last two movies. The original 2006 Cars movie came out over a decade ago, introducing us to Lightning McQueen and the quirky mix-matched crowd of Radiator Springs. We further followed them on their adventures in Cars 2, which was released in 2011. 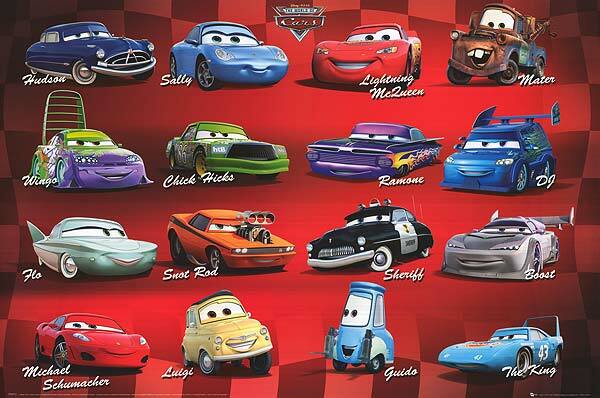 Lightning McQueen is the protagonist of the Cars movies. In the first movie, he starts out as a gifted, but very cocky rookie racecar. All he really cares about is racing and being the best. After accidentally getting left behind by his trailer, he finds himself in Radiator Springs, where through a huge mishap, he damages the little town’s road and is stuck there until he fixes it. During his time at the little town off Route 66, he learns some humility and that it is okay to slow down and enjoy the scenery. When he finally makes it to the Piston Cup, after the vicious Chick Hick rams Strip “The King” Weathers, causing him to crash, McQueen goes back to help Weathers finish his final race. Over the course of the movie, he learned that winning was not everything. By the second movie, McQueen is not a rookie anymore and has won 4 Piston Cups and goes to compete in the World Grand Prix. The movie ends with him competing in the final race back in Radiator Springs. 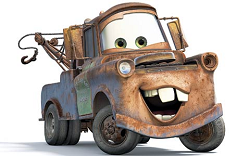 Tow Mater is the quirky and loveable rusty old tow truck that has a way of working his way into your heart. He teaches Lightning McQueen about driving backwards and tractor (cow) tipping and shows him that there is more to life than just racing. Throughout the first movie, he develops a friendship with McQueen and eventually becomes his best friend. In Cars 2, he follows McQueen to the World Grand Prix, where he helps spies Holley and Finn stop the evil Professor Zundapp from blowing up innocent cars, including McQueen. At the end of the movie, Mater is knighted by the queen for saving the day. Sally is Radiator Springs’ resident attorney and McQueen’s love interest and her main goal is to restore Radiator Springs to its former glory, when cars would regularly take route 66 to cross the country and go right through their little town. Her goal is achieved once McQueen makes Radiator Springs his headquarters, bringing popularity to the town. Doc is the town medical doctor and judge and does not like McQueen at all from the moment that he comes into town. 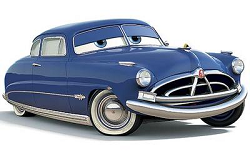 It is discovered that he is the former-racecar, the Hudson Hornet, and he left the racecar life behind after a big accident. Over time, he develops a mentor-like relationship with McQueen and teaches him that although he is a talented racer, there is a lot that he does not know. At the end of the first movie, he heads McQueen’s pit crew and when McQueen returns to Radiator Springs, they can be found racing together. Sheriff pulled over McQueen at the beginning of the first movie and is the reason that he got stuck in Radiator Springs in the first place. He is originally very skeptical of McQueen and does not trust him to complete the repairing the road without fleeing town. Over time, he begins to trust McQueen and becomes fond of him. 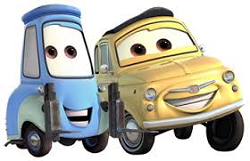 Luigi & Guido run the Casa del Tires and are immediately pretty fond of McQueen because he is a racecar, but not as much as they would if he were an actual Italian racecar. Their dream is to provide the tires and be a part of the pit crew of an actual race. Their dream is realized at the end of the first movie, when they are a part of McQueen’s pit crew and they follow him to the World Grand Prix, where they got to mingle with actual Italian race cars. Ramone & Flo are the town couple that run the autobody shop and diner (gas station). They haven’t really changed throughout the movie. They still love each other. 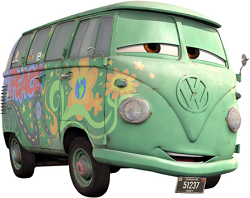 Fillmore is the typical hippie VW bus that just wants to spread love and peace. He hasn’t changed much either. 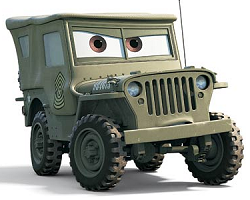 Sarge is an army truck and tends to get disgruntled by Fillmore’s hippie ways. 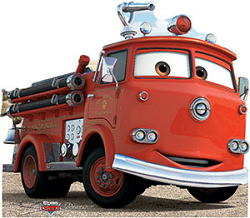 In the second movie, he saves McQueen from being blown up by trading his oil from Allinol to regular gasoline, making him one of the heroes of the movie. Red is the town’s silent, but loveable firetruck. At first, he doesn’t really like McQueen because he made him sad after accidentally ruining his flowers. After a while he warms up to McQueen and he helps catch the bad guys in London by spraying them down with water.